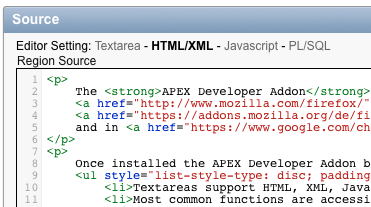 What is the APEX Developer Addon? The APEX Developer Addon is a Browser Extension (Addon) which can be used in Firefox and in Google Chrome. To make editing an application even quicker we bind key combinations to the most common tasks. The Search Box is a powerful tool, but we made it even better and introduced quick navigation Keywords. That enables you to quickly move in the Application Builder and reduce the Number of clicks you need to do. Here are some examples, you get the whole list when entering "?" into the Search Box. What about the Ad Toolbar at the Page Bottom? The APEX Developer Addon is free Software developed by Peter Raganitsch of click-click IT Solutions. In return for using this piece of software we display this little Advertisment on every Page Bottom. Updates are handled by your Browser, like for any other Extension/Addon. Some changes in the Addon require a browser restart in order to update. So if you encounter an error, always check the status/version of the Extension/Addon and restart your browser.